You want to live independently, but don't want to have to do all of the maintenance anymore. You want the privacy of your own home, but you also want to be a part of a community. ​You want the views of living out of town, but still want the conveniences of living close by. You want to live in a small town, but also want to have the specialty medical care, shopping and arts within a short driving distance. You want to be in complete control of your retirement, but you want to have someone else do the chores so you can enjoy it. Does this sound like you? The Peaks could be just what you've been waiting for. The Peaks is a new luxury retirement facility, built on the edge of Ronan, Montana in the heart of the Mission Valley. Named for the uninterrupted views of the Mission Mountains, our ten apartments and club house are accented by our numerous amenities, services and community events. We truly believe that The Peaks is the nicest place to retire, especially in the state of Montana. We are Sage and Lindsey Dorrington, both Montana natives to the core. Lindsey's family has lived in Ronan for nearly 100 years. She attended Carroll College in Helena, MT and is thrilled to be living and working back in her hometown, surrounded by family and friends. Sage's family also has ties to Ronan and was raised in Libby, MT. 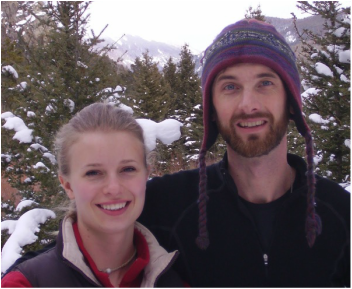 He also graduated from Carroll college and enjoys hiking, fishing, and running. Our goal is to provide the optimum service in independent living, which we see as providing wanted services and then digressing to also respect the privacy of our residents. We love to see our residents enjoy this place we have created and make The Peaks their home. We would love to talk to you or your loved ones about specific services and pricing, even if you're just looking for options in "years down the road." Give us a call at (406) 676-PEAK today!